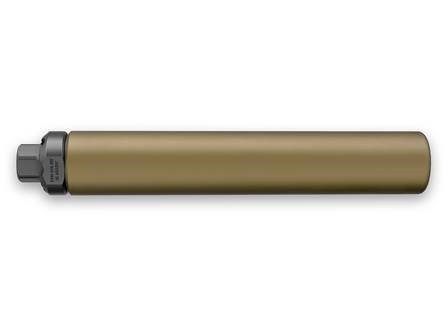 Huntsville, AL – The Jaeger 30 was designed to provide hunters with superior sound and recoil reduction when used on single-shot or bolt action rifles chambered up to 300 Win Mag. The Jaeger 30 features a Grade 9 Titanium mount and blast chamber. The outer tube and monolithic core are machined from 7075 T6 Aluminum. The black anodized Titanium mount is the strongest component of the silencer, it carries the serial number and data panel. The 5/8-24 threads of the Jaeger 30 are compatible with the majority of .30 caliber hunting rifles found in today’s marketplace. The 7075 T6 Aluminum tube and monocore are finished with Type 3 hard coat anodize. The Jaeger 30 can reduce to below 140 dB the sound pressure that results from the discharge of some of today’s most popular 30-caliber cartridges (e.g. 300 WM, 308 WIN, and 300 BLK)*. All this is accomplished by only adding 13.9 oz and 9 inches to your rifle’s overall length. The Jaeger 30 truly packs a lot of performance into a small, lightweight, and affordable package. Advanced Armament Corp., LLC (AAC), headquartered in Huntsville, AL is an industry-leading supplier of noise and flash signature reduction devices and combat-related accessories for the military, government and commercial markets. With their innovative design concepts, technologically-advanced manufacturing techniques, and core focus on the end-user, AAC silencers and accessories have been selected by major firearms manufacturers, law enforcement agencies, commercial consumers, and military organizations globally since the company’s inception in 1994. This entry was posted in Suppressors and tagged 300 Blackout, 300 Win Mag, 308 Win, AAC, Jaeger. Bookmark the permalink.